More special than the Gin Fizz and thicker and less floral than the Ramos Gin Fizz, the Royal Gin Fizz has a whole raw egg in it to make it thick and silky. Its a perfect drink for the Easter season. A light and floral gin like Sunset Hills from Fredericksburg, VA, just tastes like spring. I use organic, cage-free eggs to get the rich yellow color. 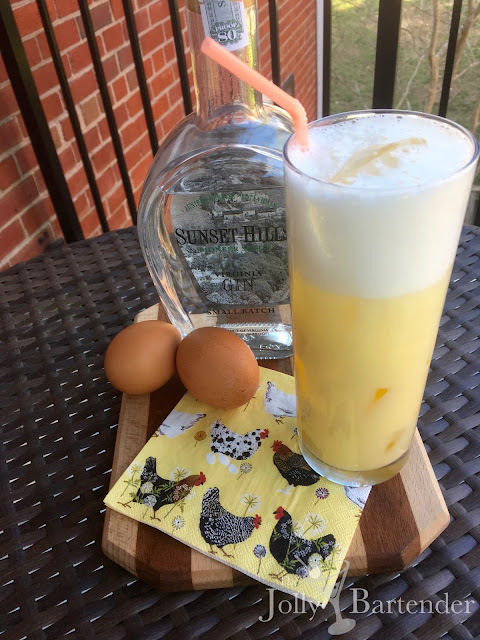 These eggs have a harder shell and a flavor and texture that holds up better to the changes that take place in drink form. To get this great foam top I shake all ingredients except the soda very hard with no ice. Then I add ice and shake hard again. Pour into a Collins glass and top with soda. Stir gently so as not to disturb the foam.